Alfred De Buys was born in Middleburg on 03 August 1899 (although some documents show other possible birth dates we assume this to be correct) and died of a heart attack on 20 November 1966. 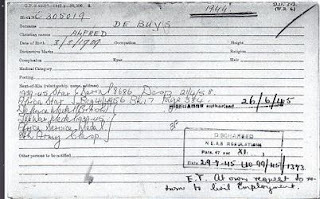 He was a labourer before he joined the military where he assumed full time duty 28 August 1941. Alfred served as a chef in the Cape Corps. 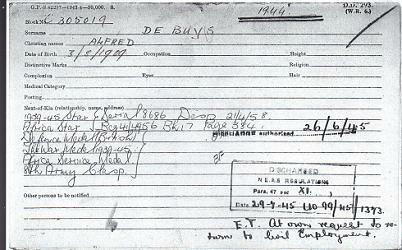 Alfred's discharge papers states that he was suffering from chest pain and pain in his legs. After the war Alfred married Rachel De Bruyn (born 1898/11/02, Richmond, died ~1979). Alfred had 4 sons and 3 daughters. If you have any information with regards to Alfred's family and or military career I would love to hear from you!